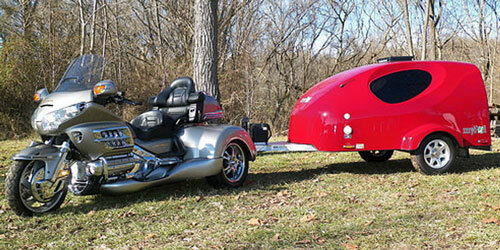 MyPod Basic travel trailer is the lightest from the family of campers manufactured by Little Guy. 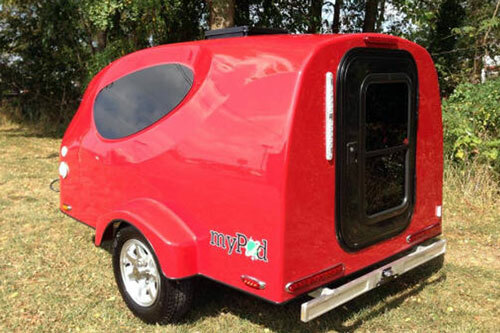 Molded fiberglass shell, aluminum frame and alloy rims as well as just basic set of features limit its dry weight to about 500 lbs so ithe MyPod camper can be towed not only by any small car but also by a tricycle. The rear door leads into small space offering seating places on the sofa. But due to interior height of just 3’1” it is what I is – just the seating space. The front-end includes some cabinetry serving as storage space although with quite limited capacity. The sofa is convertible to full-size double bed. It should be noted that the bed takes all interior space, so basically the MyPaod Basic camper is a kind of "weather-protected tent" on wheels. But contrary to the classic tent, its “weather” as well as “wear-and tear” protection is almost indestructible thanks to fiberglass shell. 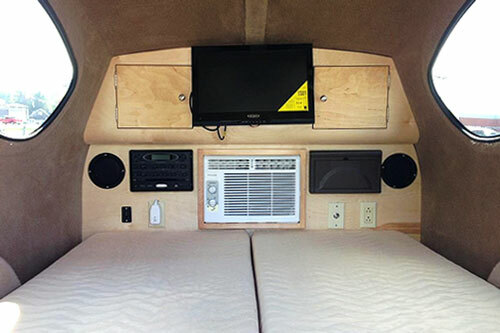 Those that need more than that may opt for a front-wall mounted AC unit and believe or not – large entertainment system including 19” flat-screen TV with DVD/CD/AM/FM capabilities, Aux input and Bluetooth functionality. Frankly, for such travel trailer it sounds like an “extravaganza”, but obviously some people cannot survive in the nature without the favorite soap-opera and the company seems to recognize this fact. 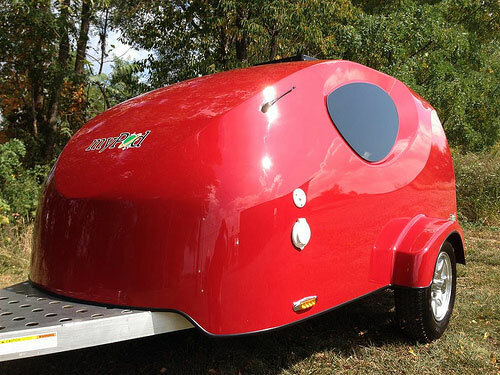 Also regarding AC - one may rightfully point-out that the roof-mounted vent will do the job…. .
Because truly, the MyPod camper in its basic version does not pretend to be the ”home-away-from-home” with residential-like features. It does not even have a galley! Keep on mind that it is not a traditional teardrop camper as most Little Guy trailers, so it does not have a kitchenette at the back nor any otherwise useful features. 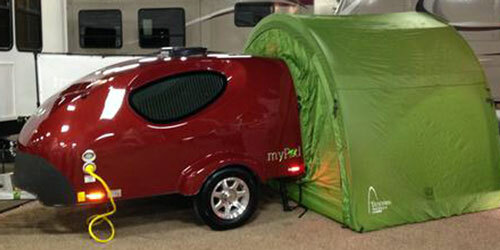 The MyPod Basic is just an upgrade from the tent. And the main differences compared to the tent? It is well protected from weather elements, offers a lot of cargo space for stuff you want to take with you, is almost ready to use, (important when you arrive at the camping late night) and it will last almost forever! It should be noted, that camper's weight (mere 500+ lbs) compared to its GVWR leaves huge potential for a lot of "stuff" (provided that your car can pull it behind). It does not mean that you have to use this opportunity and take half of your "garage" with you when going to meet the Mather Nature. Honestly, in most cases such possibility should just be considered as a possibility and nothing else. And now good news for those that would like to expand MyPod’s living space or actually create it (because camper’s interior does not provide such luxury). 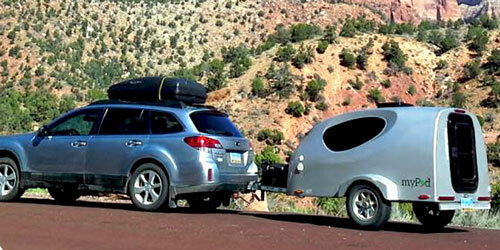 The company ArcHaus makes a “Shelter & Tailgate Tent” designed for such campers like MyPod. 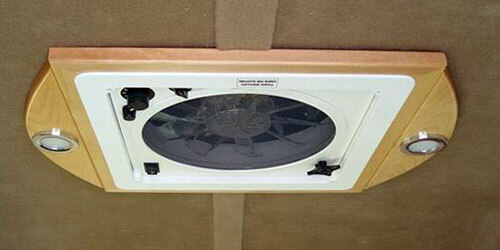 It can be attached to the back of the camper creating a “Connecting Living Room”. With dimensions 10’L x 6’W x 6’6”H it offers much appreciated walk-in/walk-out space where you can set-up your camping table, chairs and whatever else you need (presumably camping cooker, gear ….). Solid door panels with screens zip on both sides protecting the area from “unwanted” guests. Steel and fiberglass poles, polyester fabrics with polyurethane coating guarantees premium quality, high water resistance and durability…. And all this extra living space weights just 23 lbs and comes with a carry bag!